In June 2000, some friends and I flew into Salt Lake City, Utah. From there we travelled through Idaho and into Montana. From our base in West Yellowstone, we then journeyed into Yellowstone National Park, Grand Teton National Forest and Jackson, Wyoming. We even took a short rafting trip down the Gallatin River (near Big Sky, Montana). Select a link above and come along with us on our excursion. Although I took some photos in Salt Lake City, I seem to have lost those. 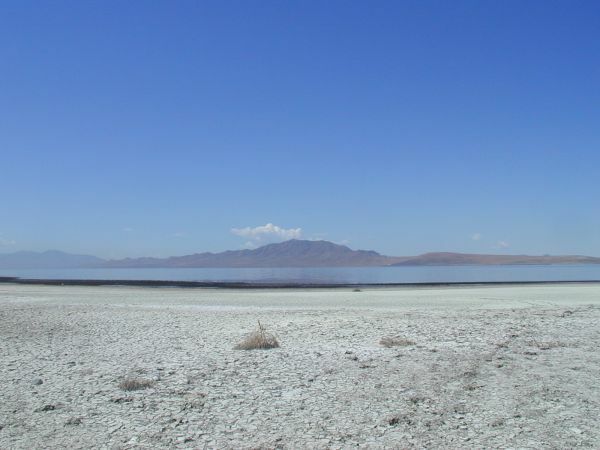 Anyway, here is one photo that did survive of the Great Salt Lake.